I have been absent from Oddfish for a couple of years, and here is the main reason why – a monograph long in the making that explores editing fully as a practice in its own right. 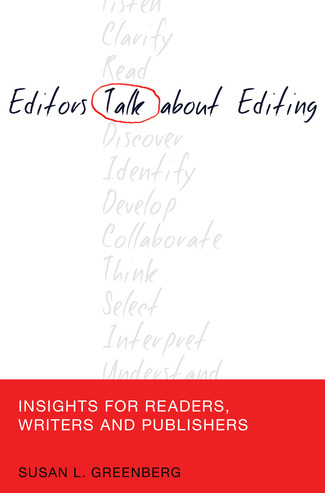 The book proposes the concept of the ‘ideal editor’, to work alongside that of the ideal reader, and the development of a new field of Editing Studies. It also defines a new materialist poetics that invites a comparative, multi-frame approach. 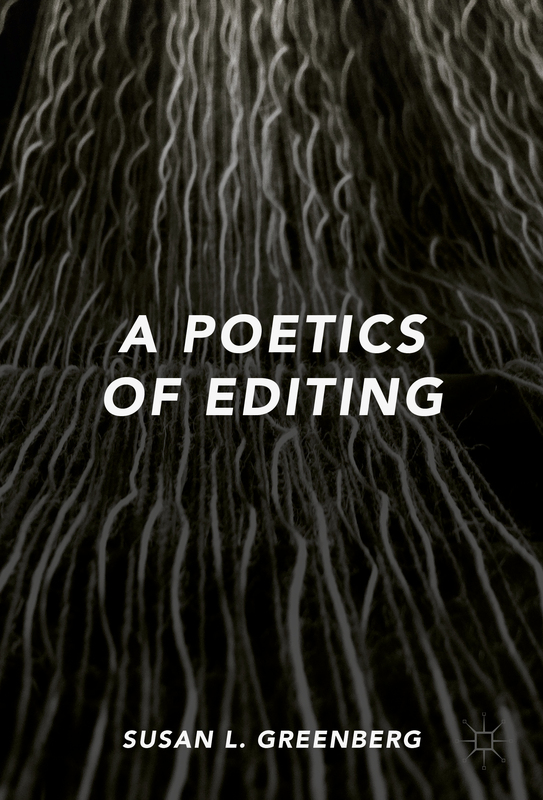 ‘A rigorous – and long overdue – analysis of editing as decision-making, wherever practiced. Greenberg draws on the insights of neuroscience, history, philosophy, literary theory, and the lived experience of writers and editors to offer an original, thought-provoking study.’ Beth Luey, past president SHARP. ‘In this powerful meditation, Greenberg explores books, writing and publishing from an original and critically important angle.’ Michael Bhaskar, publishing director at Canelo and author of Curation and The Content Machine. When I made the switch from editor to academic, about 12 years ago, doing doctoral research on that former profession was a way of connecting two different lives. Now the shoe is on other foot, and I am training to be a PhD supervisor myself. The supervisor fills many roles, but for the field of Creative Writing, the editorial role comes high on the list. In Creative Writing, both self-editing and peer-group workshopping are important, and tutors commonly tell their students they are acting as their editor. This is partly to model professional relationships in publishing, by creating a learning ‘practicum’. But it is also because a tutor’s role is to give feedback on the substantive subject, and in Creative Writing the substantive subject is writing. At the same time, for both professional and pedagogical reasons it is important to maintain boundaries; style and content are hard to separate, and authors/students need room to interpret any feedback and make the final text their own. All this means that when it comes to PhDs in Creative Writing, thinking about ‘the supervisor as editor’ is more or less obvious. What may be less obvious, however, is the extent to which the ‘editor’ role might have wider relevance to other fields. Writing is hard and most people need help with even the most formulaic forms. If that help is not forthcoming from the publisher or institution, writers can opt to hire professional editorial help. The article’s author, Nigel Krauth, draws attention to the importance of providing editorial help for all doctoral students, and recognises the full range of the editing role; it is not just the critical correction of mistakes, or surface treatment of style, but also a developmental and structural thought process. The pressure on creative writing doctoral supervisors to give editorial assistance for both academic and creative components of the work – in the latter especially, replicating the role of a commercial publisher’s editor – evokes the situation where the school takes on a role similar to that of publisher. But also, the supervisor holds a quality control responsibility like that of the commercial editor, ensuring that outputs are at a requisite standard. I will expand here by explaining that the potential clash of interests between academic and commercial editing is a particular conundrum for Creative Writing work, which typically goes to a trade publisher rather than the academic press. I think it is good to recognise the potential for a clash, as long as one underlines the prior claim of doctoral criteria. The supervisor’s job is to help the student meet the demands set for successful completion of a PhD. Research criteria require a thesis to be ‘publishable’; but in this context, it means being published for an audience of two to four people, the participants of a viva. At the same time, the constraints of a doctoral thesis can be creative, as the freedom of the doctoral ‘practicum’ offers the chance to make non-commercial choices. The demands made by publishers are important for the version which goes to a wider readership, but during the doctoral process, for the doctoral ‘edition’, they do not take precedence. In any event, one cannot assume a unified ‘trade’ view in opposition to a unified academic view: within each group, different editors or supervisors will have a different response to a text. A further thought, to my mind, is that, yes: writing is hard. But editing is hard too! Not all academics are good at writing, and even professional writers in the Academy are not necessarily strong in editing. If supervisors are to provide editing help, one can do more to train them in this role. One can also do more to recognise the extensive editing work done by academics in many disciplines – for example, editing a collection of essays or chapters – which is not recognised in the REF. A project I have worked on for more than two years has just gone public, and I am enjoying the pleasure that always comes with publication. A special issue of Journalism: Theory, Practice, Criticism (July 2014; Vol. 15, No. 5) looks at literary journalism, in particular the insights it brings to ethical issues. I was honoured and happy when Dr Julie Wheelwright invited me to join her in a rewarding stint as guest editors of the long-established journal. The thinking behind the issue, and a summary of the different contributions are provided in the introduction ‘Literary journalism: ethics in three dimensions’. The experience has fed not just one but two of my obsessions – editing, and the writing of narrative nonfiction. It has reminded me that the reward of editing comes not just from putting texts out into the world, but also from presenting work in a way that helps it to join a conversation and advance the debate. A text is not just a text: it is changed by the forms and conventions of publishing. A journal article is different from a blog post; an article conceived as part of a larger set is different from a random collection. It also gave me a chance to think even more deeply about the nature and practice of nonfiction writing, which I teach at the University of Roehampton. In the wider culture, narrative or ‘literary’ nonfiction can be presented as an oddity; it is ‘not’ fiction and ‘like’ fiction. Fiction is the reference point for artistic writing, and any attempt to include narrative nonfiction is perceived as a distortion of its core principles. My own argument, in one of the journal’s essays, is that the Ur text for these discussions – Aristotle’s Poetics – explicitly does not exclude storytelling that makes a truth claim when it defines the principles of written art. Going further, I say that the telling of true stories can offer the most demanding test of those principles; demanding, and therefore exciting. Ethics enters into the debate in multiple ways. I am not the first to argue that there can be an affinity between ‘doing the right thing’ and ‘doing it right’. For me, the search for fresh and precise language is a form of detailed reporting and verification and the impulse to avoid cliché has an ethical dimension. Truth and beauty do not have to be opposites. In passing, as an illustration, I apply the argument to conspiracy narratives. The ethical grounds for criticising conspiracy thinking focus on its unfalsifiable resistance to reason. In Aristotle’s Poetics, reason serves artistic plausibility. Aristotle himself warns that ethics and aesthetics can come into conflict: in life as in art, people tend to prefer the ‘plausible but impossible to the implausible but possible’. But even when the priority is aesthetic, not ethical, the question of what makes something ‘plausible’ is fraught. Conspiracy narratives are saturated with what Aristotle calls ‘false enthymemes’, premises that do not support the conclusion; incomplete chains of logic; exaggeration; confusion of precedence with cause; and a tin ear for ‘relation, aspect and manner’. There is another aesthetic basis for criticism. For writing that aspires to some sort of success, the Poetics says, it must also create ‘astonishment’ and this requires sophistication in the portrayal of plot and motive. The problem with conspiracy narratives from this point of view is that when they are looked at together as a genre, they are wholly predictable and implausible. If the conspiracy theory is a genre, it is a hoary potboiler. A few days ago, I celebrated a personal triumph. On February 28, the registry office at University College London rolled out its latest monthly list of graduates and my PhD in Information Studies (Publishing) took full official effect. Meet Dr Greenberg: author, editor, scholar, teacher, and occasional blogger. Although insignificant in the bigger scheme of things, the triumph counts as major news on this blog, started four years ago to help me lithify stray thoughts about a new scholarly identity. The odd thing is that so far, I have posted hardly anything about the doctoral thesis. Some reflection about a previous life as journalist, and news about other projects; but when it came to the thesis itself, I felt protective. Until it was written, I was not entirely sure what it all meant. The final title, ‘The Hidden Art of Editing’, only emerged in the last few months. Hopefully, the work will not remain hidden any longer. One book is already contracted with Peter Lang, a set of fascinating interviews with practitioners. Another is now in the proposal stage: a countervailing view of editing as a way of opening up the text, rather than closing it down. There is a lot of mystique about doing a PhD. Often, that is not helpful. It is stubborn persistence and hard-headed planning that allows a student to come up with the goods, and steady, predictable support from the host institution. But there is something magical about the doctoral journey and its strange intensity. Perhaps all major projects have this quality; the difference is that the doctoral thesis, at its best, must combine both imagination (the ‘original contribution to knowledge’) and solidity; the careful placement of stepping stones that allow the reader to retrace one’s steps. In my case, the journey was taken later in life, alongside a full-time job. And by the nature of its subject matter, the research marked not just the start of a new professional life but the culmination of a previous one. On one level, there is a surprising constancy in the concerns pursued over the years. On another, my thinking has gone through a complete transformation. Meanwhile, life happens. During the seven years since the start I began a new career, faced the end of a marriage, said goodbye to a parent and fought a life-threatening illness. It is not surprising that finishing became an act of defiance. It feels a big deal for the whole family too. Only a fraction of the extended family has a first degree, and I am only the second person with a doctorate; the first was won nearly 40 years ago. Although personally I have met with only warm support and affirmation, our wider culture’s attitude to academic achievement is mixed, and sometimes contradictory. People demand qualifications from professionals as a marker for trust, but they are also sometimes attacked as ‘credentialism’. When a policy advisor was found to have lied about having a PhD, participants in the public debate were obliged to offer a basic defence of why that mattered. For me, the PhD was never just about the qualification. It was about making discoveries that could be recognised by others; joining a conversation that might survive the tests of time. It also feels valuable for its own sake. The last year of doctoral work, during a wonderful period of leave, provided dreamy freedom, perhaps the first since those long exam-less summers of girlhood. Not dreaming as in ‘ivory tower’, but dreaming as discovery. After a lifetime of short-term demands I was able to think things through; things that really mattered to me. The kind of dreaming that puts your feet on firmer ground. The kind of dreaming that changes everything.